Being in the sports video industry, our videographers have to be prepared for anything when it comes to shooting video in the heat of the summer. We do whatever it takes to get the best video shots possible, even if that means sweating profusely under the sun! Proper preparation for shooting outdoors takes time and purposeful thought. Having a mental checklist of things you will need in the field is key. 90-110 degree heat can be dangerous if not ready for it! One thing that can be very helpful on a hot day while lugging a camera around is wearing some kind of headwear. 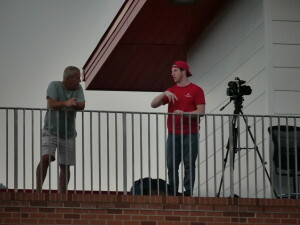 I like to wear a ballcap, but I have seen other videographers wear all kinds of headgear such as a bucket hat or a visor. Anything to keep the sun out of your eyes consistently is crucial. A hat can be helpful while focusing on your athlete or object through the camera. It also can be a useful tool for covering your camera from time to time, to protect your device from overheating. As always, food can always keep your energy up in the field. On most shoots outdoors, we will pack light snacks like crackers, fruit chews, or sunflower seeds. This can be particularly helpful if you are stuck shooting an event for hours at a time and can’t step away from your camera. Finding something in your pocket to keep your blood sugar at a healthy level makes you grateful. The single most important word to remember while shooting video outdoors in extreme heat; Water. If members of our video team know we will be spending multiple hours in the sun, we always bring a cooler full of water bottles and/or water jugs. Staying hydrated allows you to best combat the heat and stay focused on what you are trying to shoot. In addition, water can also be helpful in cooling one down if necessary. It never hurts pouring an ice cold jug of water over your head! 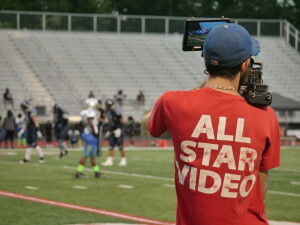 Thankfully, most of our videographers love to shoot at these sports events outdoors, so they tend to be unfazed by the heat. It is always important though, to remember to be safe when exerting yourself outside in any capacity.